Where in the Body is it Stored? Uptake and loss of carbon monoxide and the stores of carbon monoxide in various compartments in a normal human. From: Coburn, R.F. (1970) The carbon monoxide body stores. Ann. N.Y. Acad. Sci., 174, 11-22. The major repository of CO in the body is the hemoglobin in the blood, while muscle hemoglobin, called myoglobin, is a secondary site. 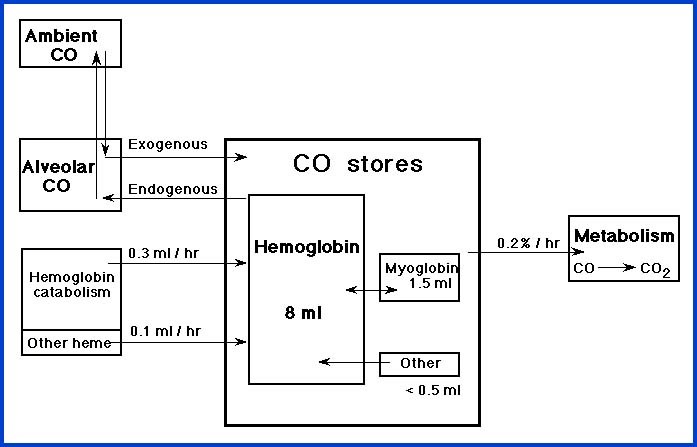 Small amounts of CO are synthesized in the body by the breakdown of hemoglobin, and even smaller amounts are metabolized (ie. broken down) in the body. The vast bulk of CO enters the body via the lungs and leaves by the same route.